"This is our way out, it's perfect." Starz Digital has unveiled a trailer for Jay Martin's 7 Minutes, a modern day intense heist movie about three friends forced to commit a brazen robbery, but end up in a "game of life-or-death". There's some interesting twists and turns that they hint at in the trailer; I'm curious who that guy is that pops up at the end with the shotgun. The cast includes Luke Mitchell, Leven Rambin, Jason Ritter, Kris Kristofferson, Joel Murray, Kevin Gage and Zane Holtz. The film is the feature debut of music video director Jay Martin, who also worked as a storyboard artist on a number of major features (I Am Legend, Catching Fire). It looks like it might be engaging, with some solid action throughout. Fire it up. Plot synopsis: After becoming indebted to a psychopathic drug lord, three desperate young men are forced to commit a brazen robbery. What begins as a simple plan - 'in and out in seven minutes' - quickly escalates into a dangerous game of life-or-death. As each minute of the heist ticks by, true motives are revealed and unexpected twists ratchet up the stakes to a thrilling crescendo. The feature film debut from celebrated music video director Jay Martin, this stylish and fast-paced crime thriller stars Luke Mitchell, Jason Ritter, Leven Rambin, Kris Kristofferson, Zane Holtz and Joel Murray. 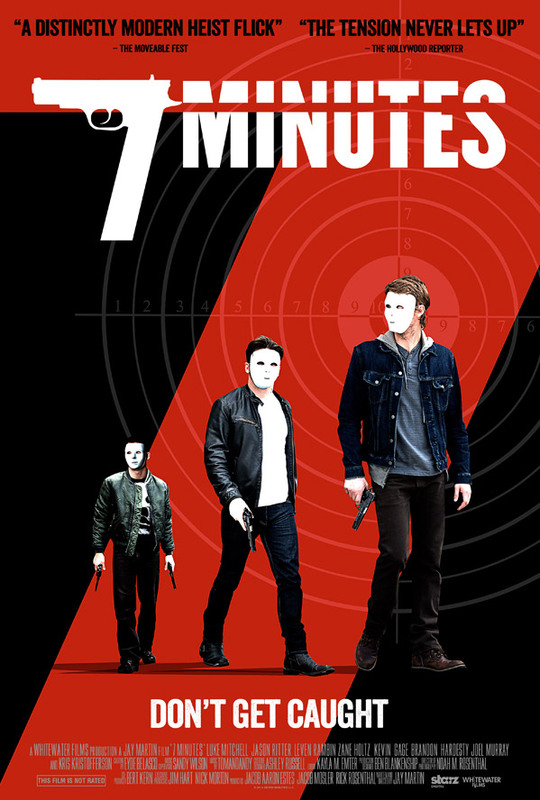 Starz Digital will release Jay Martin's 7 Minutes in select theaters + VOD starting June 26th this summer. Queue it already right here. Wait, I thought Wayne Gro died in Heat? Yeah boy! That is what I look for in a good heist film. Like putting a curved knuckle against a pressure point and never letting up. Reminds me of one of those badly written movies in the 90s that thought they were copying the Tarantino template for success... Just not as cool as it seems to think it is.